A personal development plan can be a complex plan of a myriad of layers of to-do tasks that will change your thoughts, beliefs, attitudes and behaviours. It’s an amazing feeling of freedom to consciously design your life as you want. 🙂 You really need to start here when designing your personal development plan but then you can expand further into your journey. Step 1: Let’s say you’ve noticed some annoying aspects of your personality that are really sabotaging your chances of succeeding. You NEED to write those down. Write them down when you complain about them. You’ll probably need to carry around a notebook for this. Consider this your Thought Journal, but instead of writing down all your thoughts you’re just investigating the thoughts that are particularly complaining about your stuckness in life. Step 2: What else do you need/want to change? If you don’t know what you want then how will you make suitable plans to change? Take the time to really nut out what you want to change and improve in your life and your personality. Step 3: Now that you have a list of things it’s time to put into place the personal development plan. It’s easier to give a personal development plan example if I knew more about your journey and what you wanted to change because each person is unique and therefore would need to implement different personal development strategies. But let’s say for example you noticed yourself getting lazy when it came to job hunting (or anything else), so an aspect of your PD plan would be to Get Yourself Motivated. And you would need to look at your underlying beliefs and the thought patterns involved. 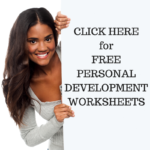 So, as you can see – giving a specific personal development plan example is really quite complex and would depend on your personal circumstances. The basic steps are: 1. Write down what you want to improve/change in your life, 2. Write down what would stop you from achieving that including aspects of your personality, people around you, environment, etc. 3. Put into place personal development strategies that would increase your strengths. To give you more of an idea I recommend you check out my online course: PERSONAL DEVELOPMENT: ULTIMATE SECRETS TO AN AMAZING LIFE which is available on Udemy. This entry was posted in Personal Development Resources, Personal Development Tips and tagged personal development, personal development plan example, personal development tips. Bookmark the permalink.